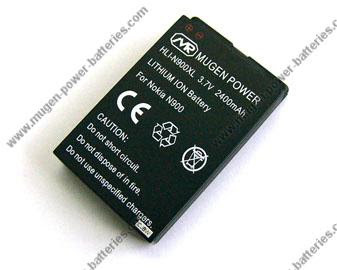 A few months back I wrote a post mentioning that I had ordered a Mugen Power battery for my N900. If you have been by my blog here before then you may know that while I love my N900 the battery life isn't all that amazing (like most smart phones). If I am using the N900 to it's fullest extent I am able to drain the stock battery in just over two hours. The stock battery weighs in at 1320 mAh. The Mugen Power extended battery is nearly twice this size (2400 mAh). The N900 is a bulky hand held by default and the Mugen Power doesn't exactly help this figure. The extended battery makes the N900 around 30% thicker, as a comparison base this isn't much larger than the Otter Box makes the N900. 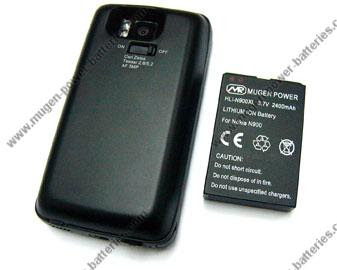 The Mugen Power comes with a replacement back panel for the N900 (see the above image). This back panel is of a quality make and clips firmly to N900. Unlike the default panel, this Mugen Power panel does not contain a shutter over the camera lenses. For those that use the camera lenses opening to trigger applications launching on their N900 (I know I do), don't worry because there is an up/down switch on the Mugen Power panel that performs the same function as the old shutter. Another important thing to note is that while this back does make the N900 a bit thicker it doesn't obstruct the camera lenses at all. Also, since I mentioned the Otter Box - it is worth noting is that you cannot use the Mugen Power with the Otter Box case. In my couple of weeks of testing I found the Mugen Power to over twice as long as the stock battery during my every day use. I went from having to find an outlet (or a powered USB port) by 2pm - too being able to get through my entire day on a single charge. Before I would connect to 3g only when using it to conserve battery, with the Mugen Power I could now leave my mobile Internet connected the entire day without a second thought. When you first get the Mugen Power, as with any lithium ion battery, you will want to fully charge and then fully discharge the battery several times to maximize it's capacity. I found that even with my 3g connected all day I had trouble fully draining the battery to an empty state in just a twelve hour period. The final thing I would like to mention about the Mugen Power is one of reasons why it has taken me five months since placing the order to write this summary. About two weeks after receiving my Mugen Power battery (right after it was finally broken in of course) my N900 took a tumble off of my kitchen table to the hardwood floor. I am not sure if it was just a fluke with the battery I had received, but this less than three foot tumble to the floor was enough to render the battery completely useless. The battery refused to charge and after contacting Mugen Power they advised me against using the battery any further. Mugen was very understanding, all I had to do was pay to ship the broken battery back over seas and Mugen then sent me a replacement free of charge. The extended battery does come with a bit of a hefty price tag, just under 100 USD. If you are someone that doesn't like having to remember to charge their N900 halfway through the day (or doesn't want to) then the Mugen Power battery is a quality piece of hardware worth the price. Do you think you are going to pick up an extended battery for your N900? What other accessories do you have for your N900 that make it a more enjoyable hand held to use? You see, even with all of the FOSS projects Netflix supports they choose to use the DRM ridden Silverlight plugin to stream video over the Internet. This prevents the streaming service from functioning on FOS operating systems (Linux, BSD, ect.) at this current point in time. Why the lack of support? Some will say Linux has a small market share so is not worth the extra time it takes to support the platform. Personally, I find it a bit absurd that they can find the time to support Windows, OSX, PS3, Wii, Xbox 360, iOS, and now even the Linux based Android and still not provide a general streaming solution that would work across all PC platforms. As Netflix themselves stated, it is often cheaper to employ an FOSS solution to remedy software needs - so why they do not use an FOSS medium to stream their media is beyond me (or heck even a closed sourced solution such as flash that is cross platform). In my opinion, Netflix loves FOSS just about as much as Microsoft does. They see it as something that can help their bottom line and nothing more. Don't get me wrong, I understand companies need to make money - but in my opinion if you are only utilizing FOSS to turn a larger profit, then you are falling far short of realizing the true reason this type of software exists. Two nights ago after many complaints, complements, bug reports, and themes myself and the Bodhi Linux Team pushed out our forth alpha release of the minimalistic, enlightenment using distribution. This release includes a few bug fixes, ELF Beta 3 packages, Firefox 4.0 B7, and a good deal of "polish around the edges" previous versions of the distro had lacked. For a full change log see here. 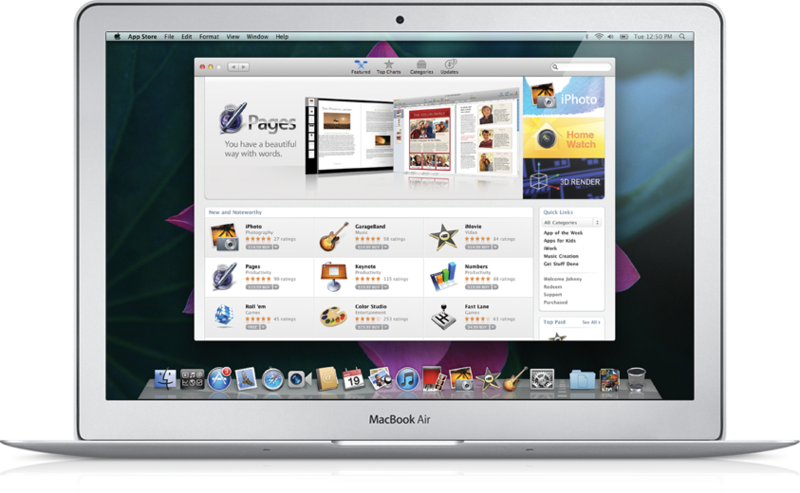 As our development team is small we still only have a 32 bit disc available. This 0.1.3 release is a bit larger than previous versions, coming in at 385 megs (still under our 400 meg goal). 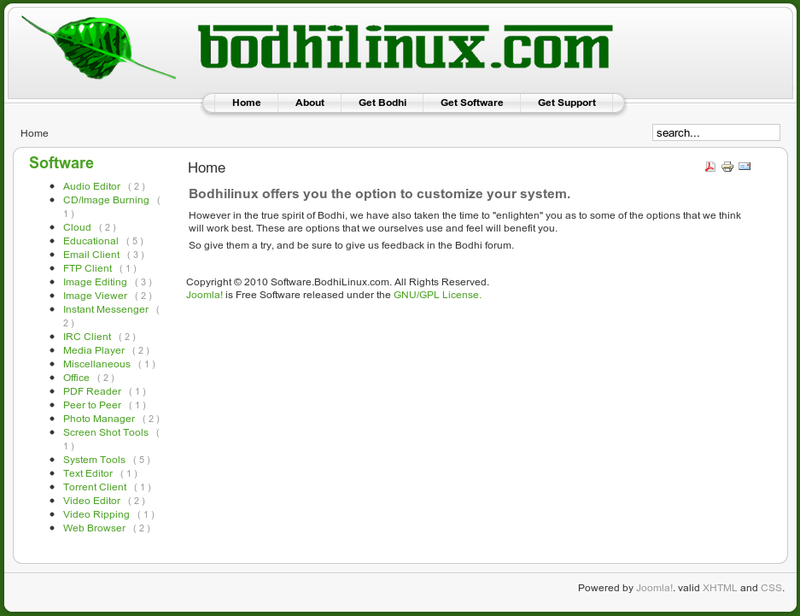 You can get Bodhi 0.1.3 via high speed torrent download here or via a bit slower direct download (via source forge) here. 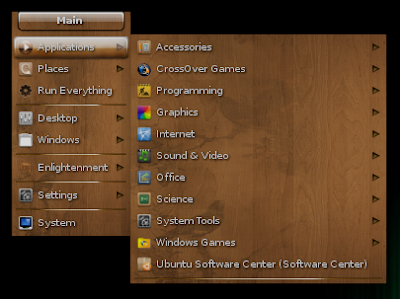 If you know of anywhere that would be interested in doing a review of the distro please feel free to contact me via JeffHoogland at Linux dot com (I would post one myself but I think that would be a bit tacky). Thanks for using Bodhi and please report bugs as always! One of the reasons I gave for giving the Enlightenment desktop a try was its elegance. While it is true that Enlightenment has a good number of built-in effects that run on a wide range of systems, those with a more powerful system might crave something more. 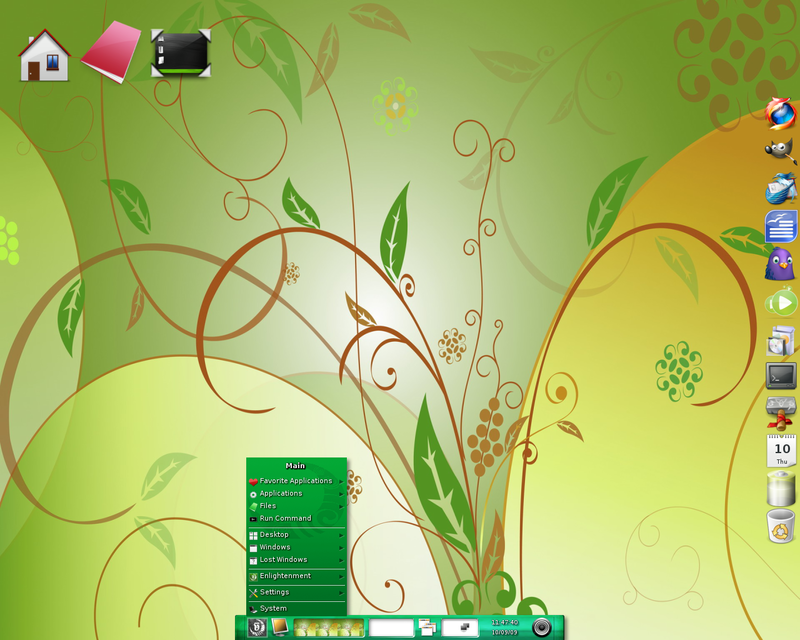 If you are coming to Enlightenment from a previous Linux desktop odds are you are aware of Compiz Fusion (a compositing window manager known for it's many different effects). 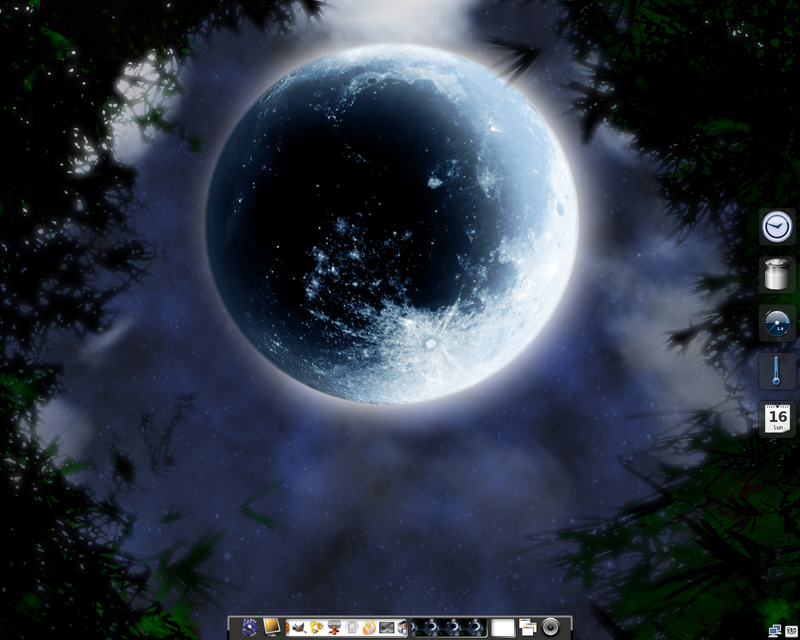 Thanks to the Ecomorph module for Enlightenment, you can enable many of your favorite Compiz effects on the Enlightenment desktop. 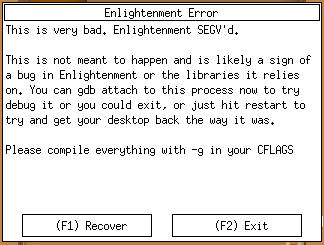 On other Enlightenment distributions the install command and package names will vary. 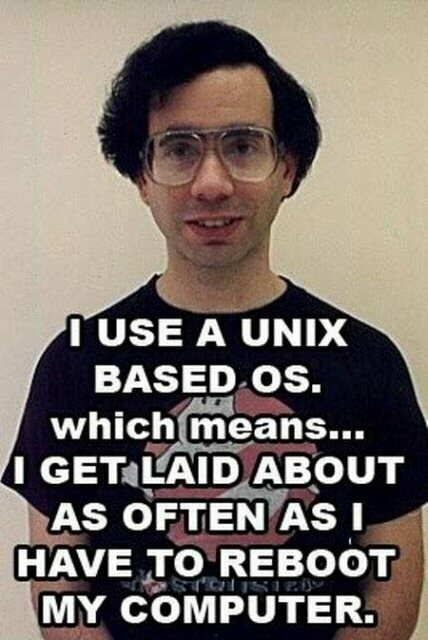 You can also always compile it from source. 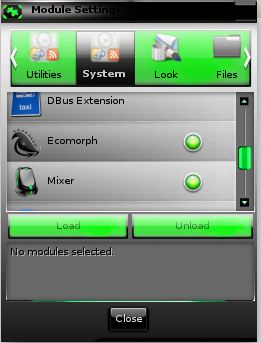 Once you have Ecomorph installed, load the module (Settings->Modules->System). 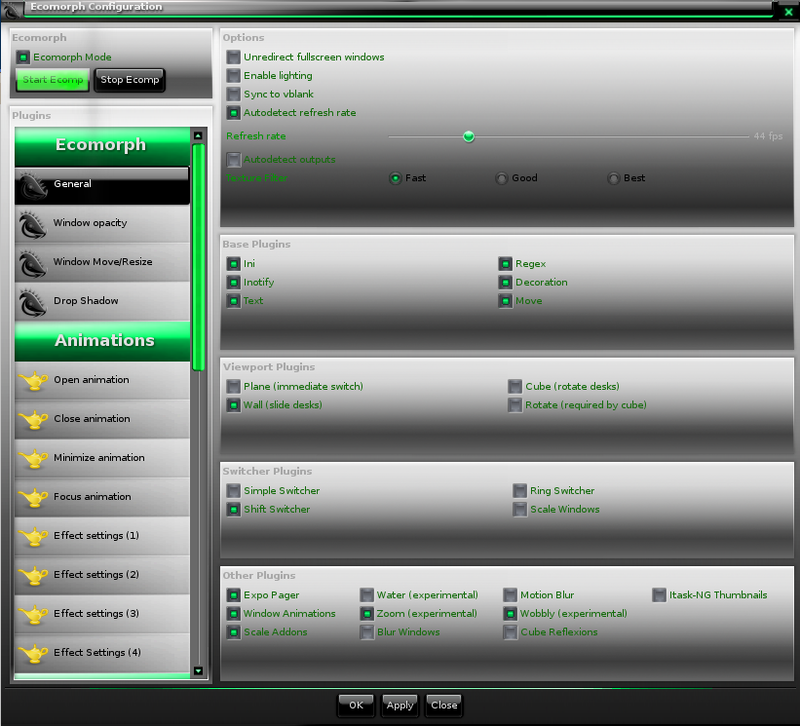 It is also necessary to disable the Dropshadow (and built in compositing if it is enabled) module under Look (it conflicts with Ecomorph's built-in shadow). For the contents of the desktop file, paste in this. Save the file. 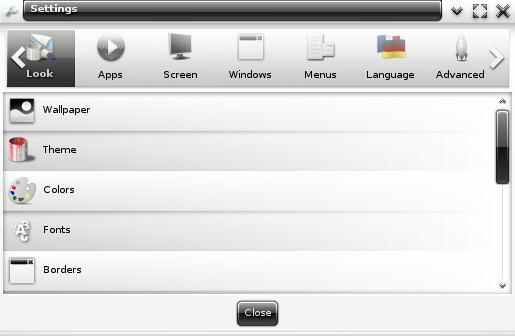 Then, if you want to always start compositing on login add our newly created menu entry to your startup applications. Finally, log out and from your session list select E17 - Ecomorph instead of Enlightenment when you log back in. Please note: if you did not add Ecomorph to your startup applications you will have to manually launch the desktop entry for compositing to become active. 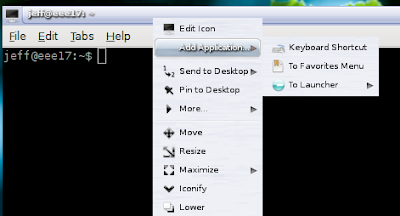 Ecomorph also adds a list of actions you can bind to your preferred key-sets (such as toggling expo). 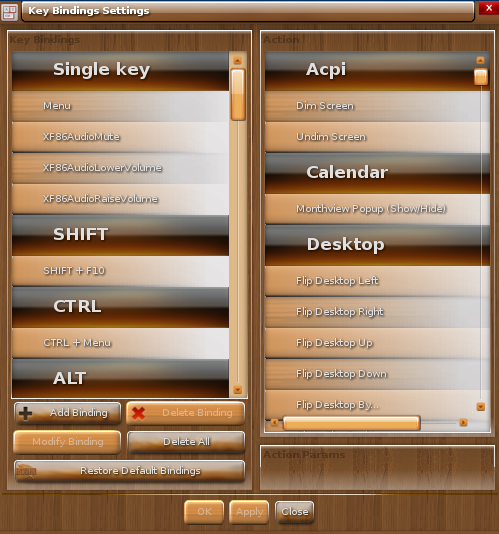 Configure these under Settings->Settings Panel->Input->Key Bindings. Enjoy your tricked-out Enlightenment! 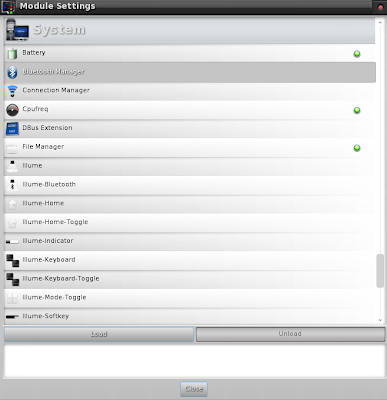 Have any questions or if issues arise while installing/configuring Ecomorph feel free to drop a comment below. 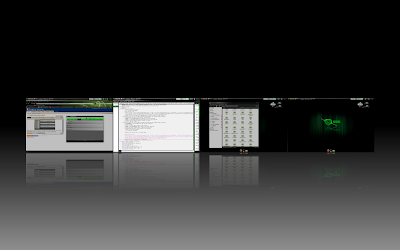 "Wayland is a protocol for a compositor to talk to its clients as well as a C library implementation of that protocol. 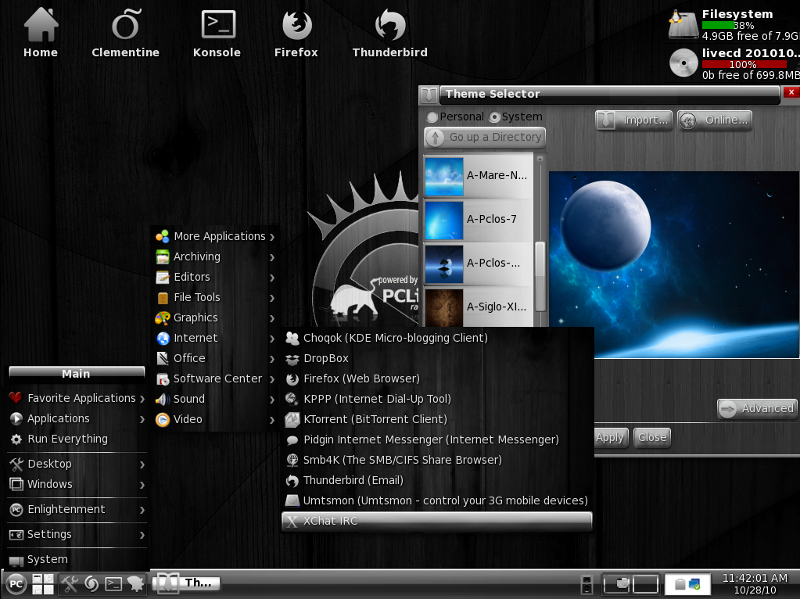 The compositor can be a standalone display server running on Linux kernel modesetting and evdev input devices, an X application, or a wayland client itself. 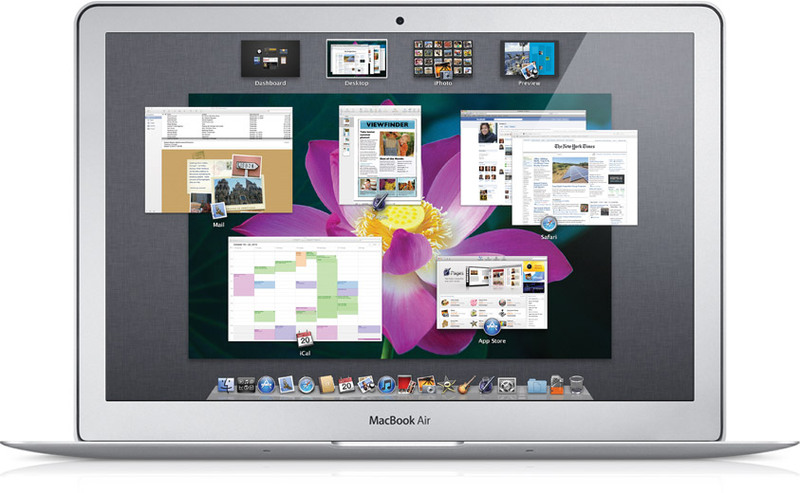 The clients can be traditional applications, X servers (rootless or fullscreen) or other display servers." 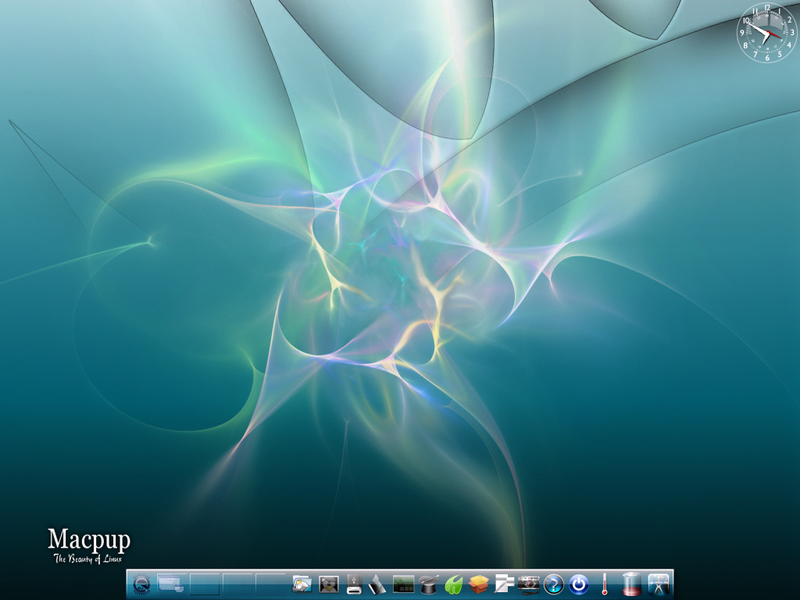 For those still unclear as to what Wayland is supposed to be doing after reading the above quote - essentially Wayland helps a compositor, such as Compiz or KWin, work with applications running on a computer. It can run on top of an existing display server, such as X, or act as the display server itself (and run X inside of itself similar to how OSX does). To each their own. 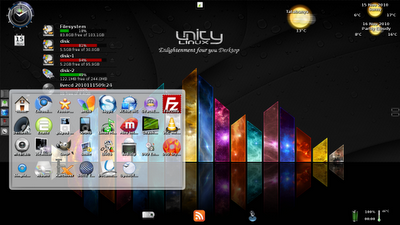 The wonderful thing about FOSS is choice - my question this: If desktops such as Enlightenment can achieve an elegant, fluid desktop while using X, why can't Unity? 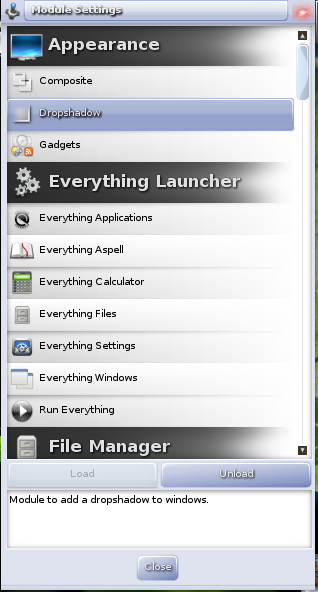 My next concern about using the Wayland project is if it is ever going to actually fully get rid of X. Mark states that they plan to keep backwards compatibility with all X applications. While backwards compatibility of this sort is something that is very necessary, I some how doubt this going to be accomplished with out keeping parts (if not all) of X around. If this is the case - what is the point of adding Wayland into your graphics layer in the first place? The last part of Wayland that is a large cause for concern is lack of closed source video driver support. As a free software advocate I know FOSS drivers are ideal (and they are advancing rapidly) but as of yet they do not offer anywhere near the performance of their closed source counter parts. In fact as of today the only open source graphics drivers that support any form of decent 3D acceleration are for Intel chip sets. While I recommend taking anything you read on Phoronix with a grain of salt - their claim that nVidia has no plans to support Wayland in their closed source driver sounds about accurate. As for ATI? Their Linux driver support has historically been worse than nVidia - so I wouldn't hold my breath here either. As with most things only time will tell if Ubuntu's (and Fedora's) transition to Wayland will be a success (or a death sentence) for the respective distros. 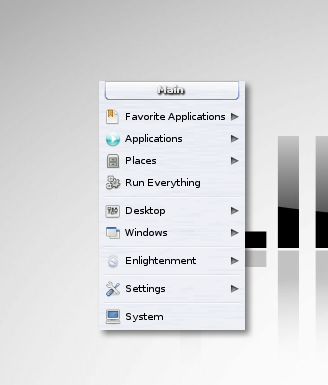 In the mean time want to give Wayland a try? Well, currently it is barely functional and only works on a limited amount of hardware. 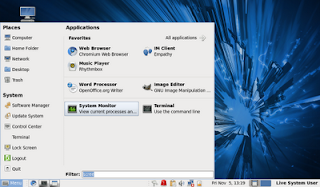 That means, in addition to all the concerns above, a good deal of time, funding, and man power is going to have to be invested in Wayland just to make the project functional for a desktop operating system such as Ubuntu. 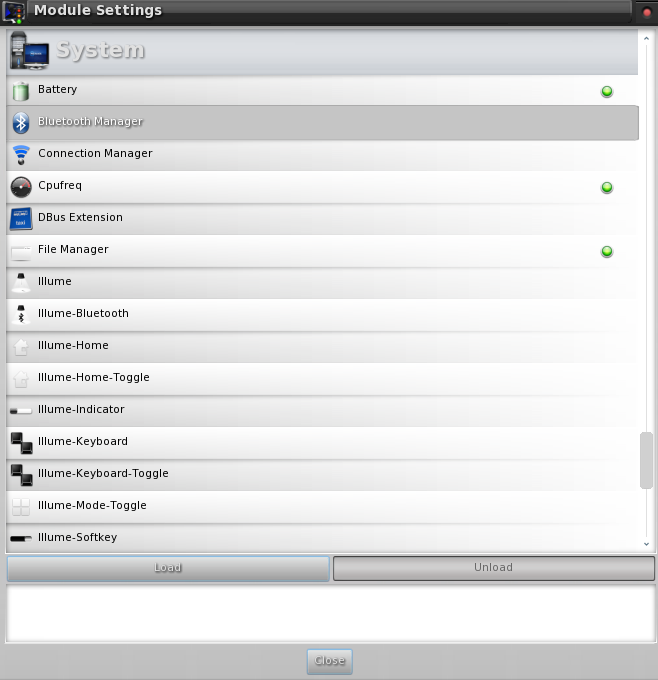 Personally, I think this announcement is premature and we won't have a functional "Wayland only" display server on a main stream distro for several years at least. What is your take in the situation? Do you think the change was necessary and how soon will it come? You may have noticed the blog has been rather quiet the last couple of weeks, this is because I have been working on a project. 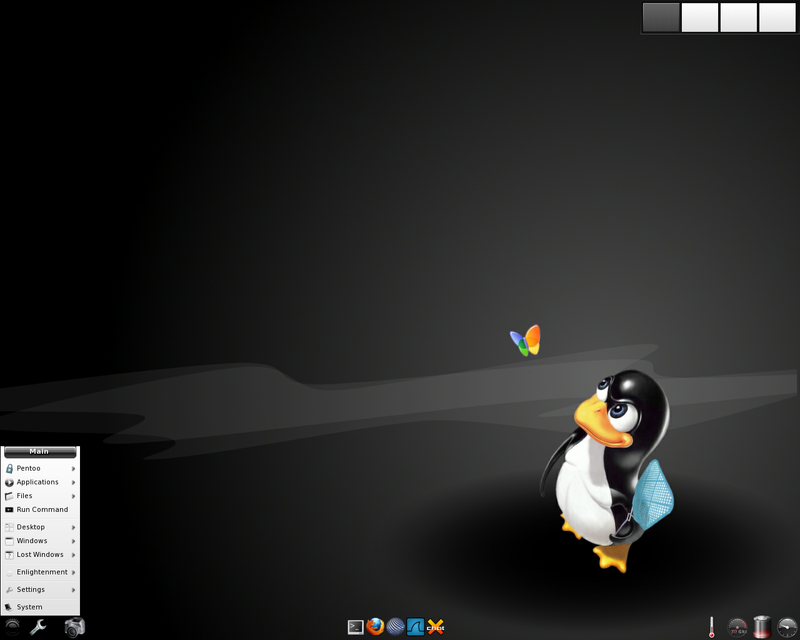 Last month I posted details about an E17 LiveDVD I was working on that was modeled after PinguyOS. 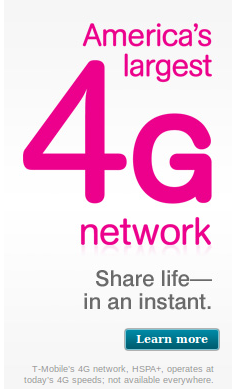 It weighed in at a 1.4 gig download that was jam packed with every application you might ever use. It was also slightly crude in some aspects (such as the Enlightenment desktop it contained was compiled and installed from source). 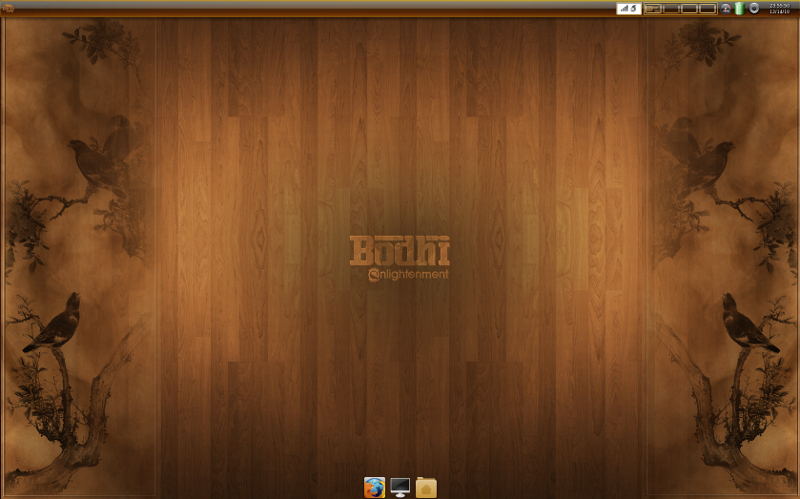 The Bodhi is built from an Ubuntu 10.04 minimal disc, but you will notice it does contain some Ubuntu 10.10 features. Backported via the Bodhi Repository, are the 2.6.35 kernel and the newer Ubiquity installer. Also enabled by default are the Ubuntu partner repository, Medibuntu, and GetDeb. 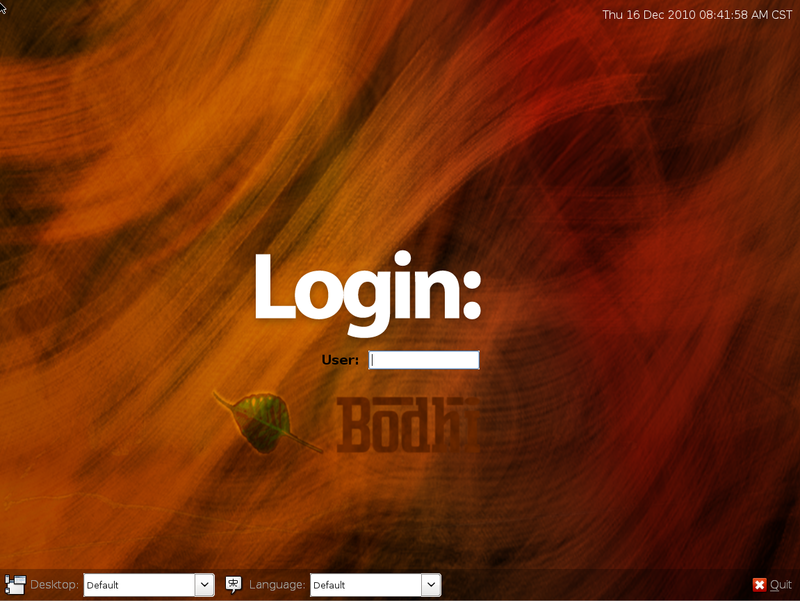 This is the first release of Bodhi and it is of alpha quality. This is a work in progress and I am looking for feedback on what is done so far (so if you are expecting something perfect go elsewhere). As I am the only one developing the disc itself there is currently only a 32 bit version built and you can get it as a download from our downloads page. 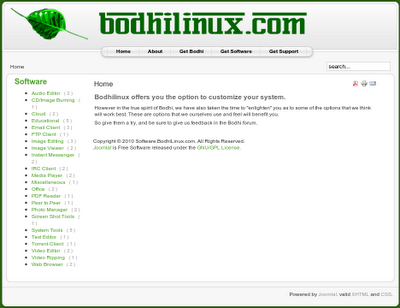 If you would like more information on the project check out our about page or stop by #bodhi on Freenode IRC. 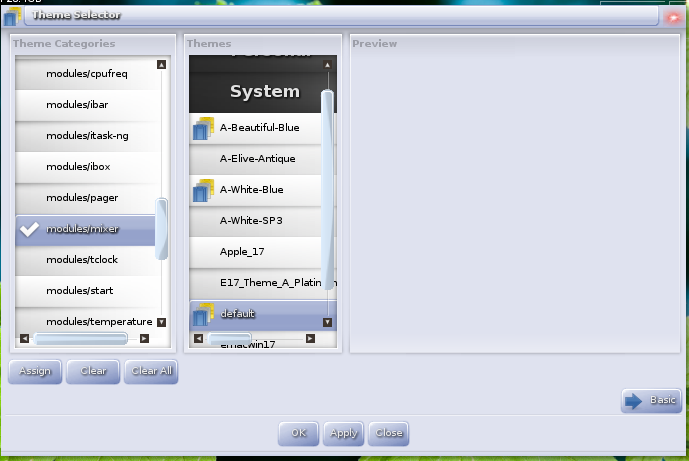 My search for a new display manager ended me back at GDM after several long hours of searching. 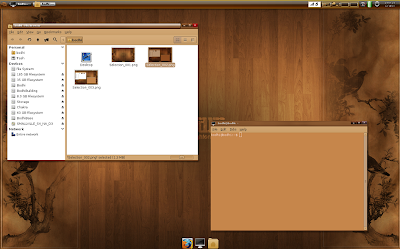 I was a bit tired of GDM's bland default brown background and the Clearlooks GTK theme so I deiced to change these. After much searching around I only found links describing how to change these options through GUI tools. I did not want to install an application to accomplish these two simple configuration changes - luckily I didn't have to and neither do you. Enjoy your new GDM background and GTK theme! 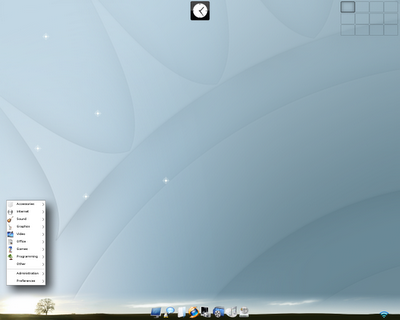 Fedora is one of those Linux distros I have always wanted to love. 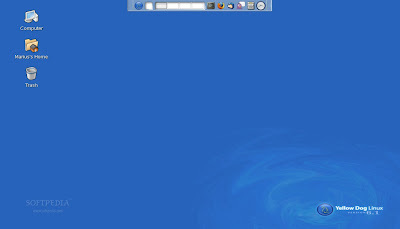 It is sponsored by one of the top FOSS supporting companies in the world, it has strong principals in free standards, and yet somehow every time I get around to installing a new Fedora release it is just enough of a hassle that I end up removing it from my computer and reinstalling some form of Ubuntu. This is why Fusion Linux sparked my interest. Fusion Linux aims to to for Fedora what distros such as Linux Mint, PinguyOS, and Zorin did for Ubuntu. 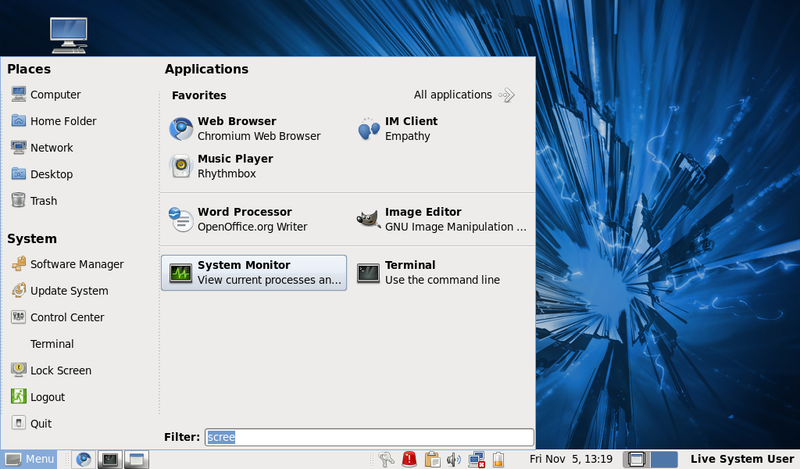 It aims to alleviate much of the messy setup work that is required to get a fully functional desktop operating system out of Fedora. 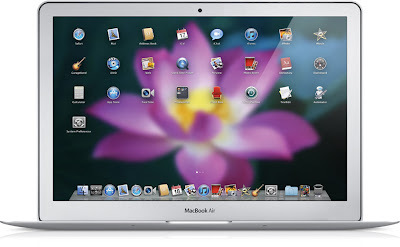 It does this by preinstalling useful applications and codecs, including Adobe Flash and Sun's Java. 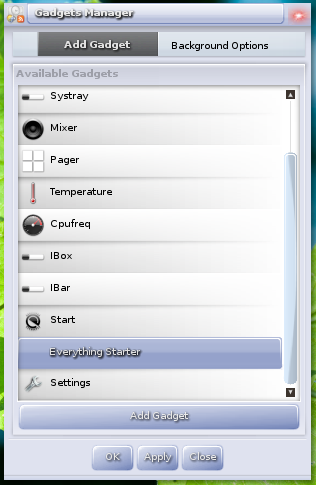 It does all this while remaining 100% backwards compatible with Fedora. According to the Fusion Blog this logo is really more of a funny place holder and they are looking for a graphics designer to create a real icon for the final release of Fusion 14, personally I think it gives the disc some unique personality. 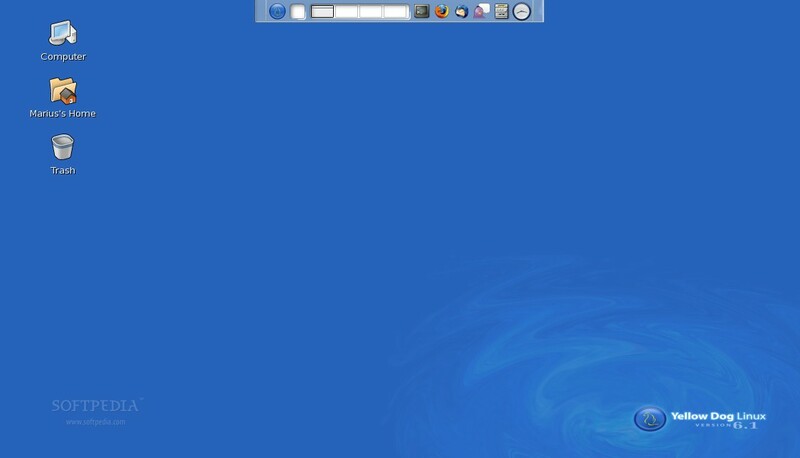 This isn't a bad thing though, for those coming from a Windows environment this setup will feel familiar. In fact, the menu you see in the lower left hand corner is the Linux Mint menu! 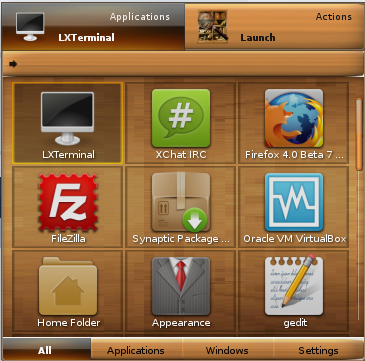 Right next to this menu there are launcher icons on DockXBar for Chromium and terminal. 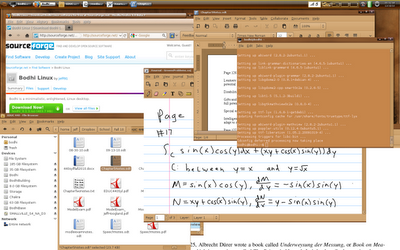 I only have a few comments about the selections Fusion Linux makes. First, is that there are two applications installed for several tasks including Brasero and K3B for burning CDs and Firefox and Chromium from webrowsing. While I am on the topic of Firefox, I would like to mention that Fusion ships with the beta 6 version of Firefox 4. 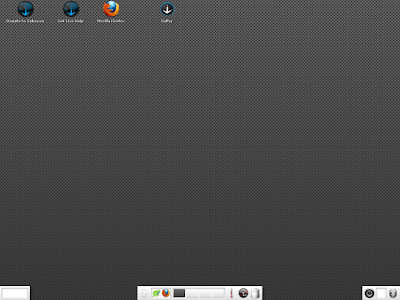 This is a good thing, the beta is fairly solid and much better than firefox 3.x. I personally have been using it for several months now without issue. 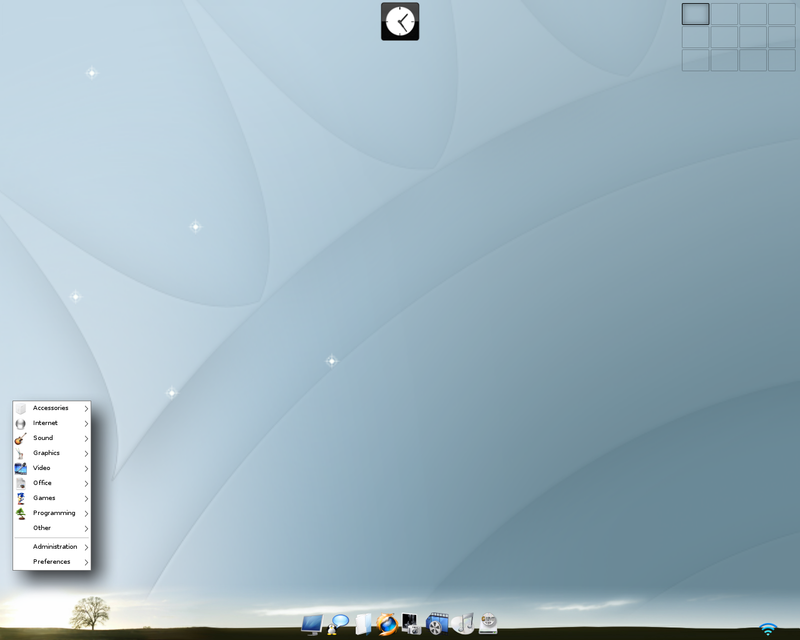 The installer for the live disc is the same one Fedora itself uses, so while it is not as friendly as Ubuntu's installer it is more than functional. Also present is a wonderful selection of FOSS games that should keep most children (and some adults) entertained for a good long while. 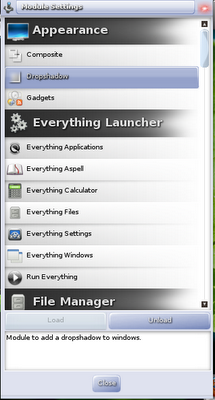 What is lacking from this application list you may notice is that there is no IRC client installed by default. 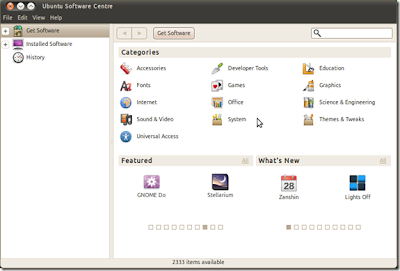 The only issue I had with the software was that upon installation the system already had broken packages. Running yum update with the --skip-broken argument allowed the system to upgrade just fine though. 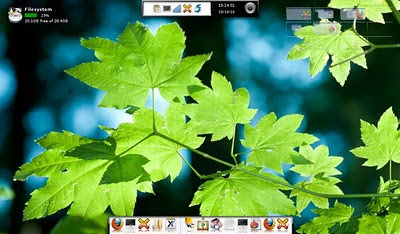 Overall Fusion Linux is a fantastic distro and for any beginner (or someone that doesn't want to deal with setting up Fedora) I would highly recommend Fusion Linux.